neighborhood was walking down to a Citizen’s Bank ATM when he spotted two robbers approaching. One was allegedly armed with a sawed-off shotgun and the other with a handgun. While details are still emerging, it appears that the concealed carrier engaged both suspects and sustained non-life-threatening gunshot wounds in the process. 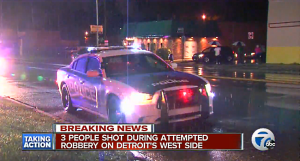 A Detroit police captain was interviewed live on the scene and said that two 18 to 19 year-old armed robbers approached the Citizen’s Bank and declared that they were going to rob everyone. The man at this point turned and engaged the robbers. 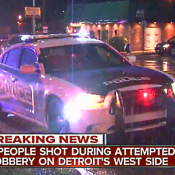 “Our victim was a confirmed CPL (concealed pistol licensee). He produced his weapon and a gunfight ensued,” confirmed the police captain to WXYZ news reporters. No other bystanders were harmed or injured in the exchange and both robbers are now in custody. Check the link for further updates as details emerge on this case.